Looking for a healthy snack after yoga that will replenish and give you a dose of energy? Look no further – presenting the Power Living Green Energy Smoothie. 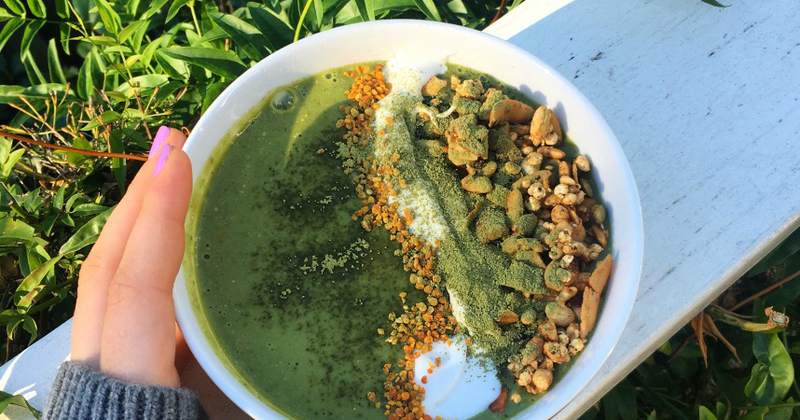 Packed with natural goodness, protein and a touch of matcha green tea powder, this smoothie is the perfect post yoga snack! Whether you’re between early morning yoga and work or just feeling drained from a whole stack of chaturangas – we promise this smoothie will not disappoint! We hear you over there, what is this matcha you speak of? Matcha is a special form of green tea that is made from the entire tea leaves, ground into a fine powder. Matcha is only made from extremely high quality green tea leaves and – as the whole leaf is ingested – provides more nutrients than regular steeped tea. Matcha tea is packed with antioxidants, boosts the metabolism and is rich in fibre, chlorophyll and vitamins. Matcha does caffeine so avoid this recipe close to bed time – however due to the content of a natural ingredient called “l-theanine”, matcha provides a sense of calmness without drowsiness – resulting in many matcha aficionados making the swap from coffee to this green alternative! Give this smoothie a go and tell us what you think! Enjoy your Green Energy Smoothie!